On September 21, 2018, Kansas Drug Card Program Director Angela Garvey visited Children’s Miracle Network Hospitals at Via Christi Health in Wichita, KS to proudly present a donation check to Kara Warkentine, Director of Development, Children’s Miracle Network Hospitals Via Christi Philanthropy. 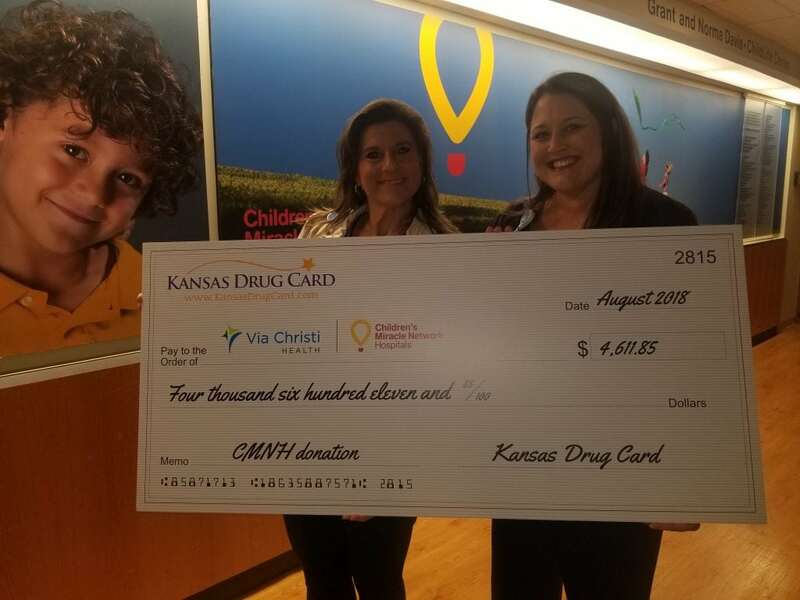 Kansas Drug Card is honored to partner with Children’s Miracle Network Hospitals at Via Christi Health to raise over $4,600 to date! Your continued support of the Kansas Drug Card help us support Children’s Miracle Network Hospitals all over the state of Kansas and we are deeply appreciative of each one of you! Since 2015, the United Networks of America partnership with Children’s Miracle Network Hospitals has raised over $2.4 million dollars for local children’s hospitals. Of this, $4,611.85 has been raised for Children’s Miracle Network Hospitals at Via Christi Health. Next post: Tennessee Drug Card, powered by United Networks of America, Continues to Support our Miracles!